Welcome to Death Castle. Death castle is 20 years old this year and to celebrate that birthday I’ve decided to restore it. It was created by my best friend of 20yrs Trevor, while we were both High School students at Woodbridge England. 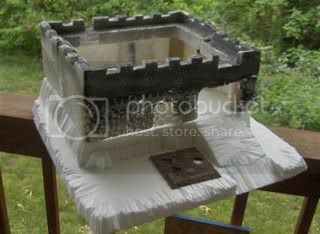 He made this castle before he met me when he and his friends discovered Warhammer 40,000. It’s construction was simple yet an ingenious use of the materials available. 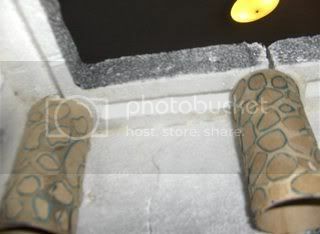 The basic design is a series of shortened toilet paper tubes over-layed with strips of Styrofoam with the front veneer using stone patterned sheets of Styrofoam that his Dad found at a D.I.Y shop somewhere locally (Ipswich?). Soon after some application of carpenters glue, the project was finished and we had a basic, yet very cool, castle to play with! My very first table-top battle was fought using this castle so the nostalgia I have for this piece is intense. Intense because I soon learned to hate it! 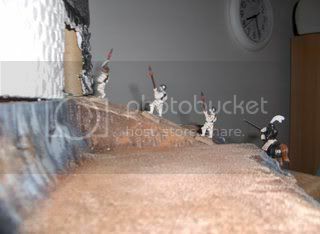 The crenellation less walls were too high, so in order to fire from it, or achieve LOS, you had to position your models at one of two preciously small openings or set your models on top of the wall. 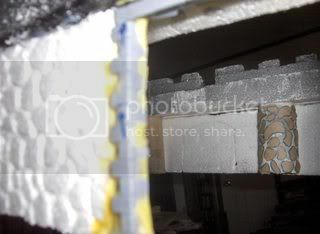 Both of those options removed the cover the wall provided thus making your defense redundant. Many units of marines were blown off the walls of this castle. Back in the Rogue Trader days, the weapon ranges were extreme and a target standing on the highest point on the table with no cover was sure to die. Yet we kept playing with this castle! Over the course of many games if became clear that the only way the defending force could win with this castle was to abandon it. In one game a force of eldar abandoned the castle just at the marines stormed it and the marines took the castle only to be slaughtered by the eldar from out side. It was clearly a death trap, and thus we named it Death Castle. Death Castle has seen some abuse over the last 15 years. Trevor’s early attempts to paint the castle were quite devastating to it. 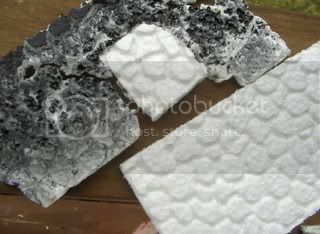 We didn’t know the horrible reaction that black spray paint would have with Styrofoam. The castle became his test bed for other painting experiments as ultimately he was unsatisfied with it and when Trevor left England, he gave it to me. When I left England it was used as packing materials! During that point it was cut in half. 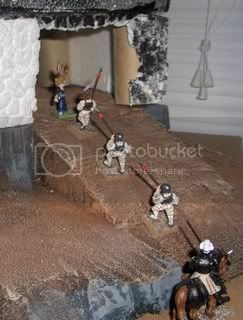 We still used the castle though, but usually as wall pieces for Mordheim or as a ruin. Much damage has occurred, and you can see from the pictures that some ad-hoc repairs have been attempted. I’ve replaced some of the holes that have been punched into it over the years. Recently, I rediscovered it, and was inspired to restore this castle to the greatness it has always been denied and finish it! · Add a base. A lot of the damage the castle endured was a result of a lack of a stable base. · Crenulations. 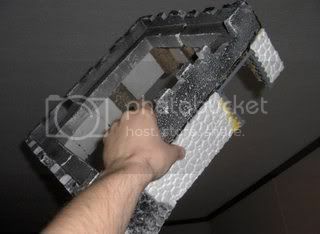 The castle needs this to be usable as a defendable position. Also enlarge the opening above the gate to be able to support artillery and/or siege defenses. · Make a real gate. The castle never had a proper one thus making the opening, which was big enough to let a Rhino pass through it, far too inviting to attackers. 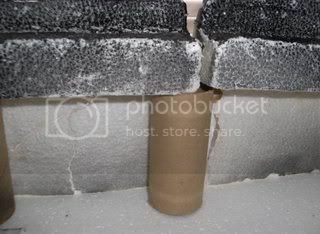 · Repair wall sections. I have enough left over foam pieces to be able to fully restore it. · Enlarge the upper deck. 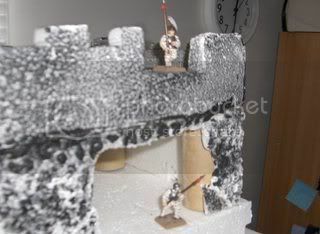 Reviewing the siege rules that have came out over the years, it seems that the upper walls are too narrow and although they easily support one model are just too small to support two. I’ll need to enlarge this to accommodate combat on it without risk to our models. · Add an internal building of some kind probably a tower. · Add stairs. However I may skip this if I go with a tower that abuts the wall. · Level the top of the wall. 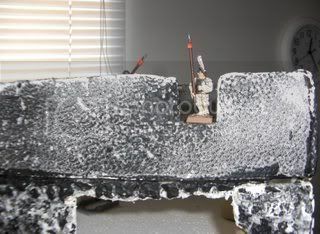 The melting caused by spray paint has caused stability issues that can result in some models easily falling off the walls. I’m considering making the top magnet friendly. · Finish this by December. I’m not exactly sure which month the castle was built, but my first game using it was in December of 1988. Great idea and a good hommage! I hope it'll work! I can now cross one item off of my list: The crenulations are done. They are not the smoothest cuts, and this is intentional. A quick subtle blast of spray paint on these new openings will help maintain the weathered look of the rest of the castle. I have also made the opening above the door larger. I’m still working out whether to do this to the opening at the back of the building also. I have decided that that corner will be where the building will go and I have decided that the building will be a tower. The tower will be tall, acting as a stairwell, and keep. 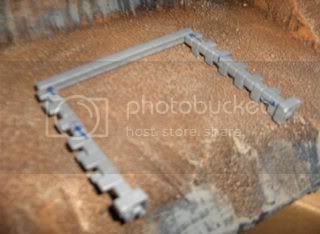 Attempting to model stone steps for Warhammer has always bothered me; Castle steps tend not to be very wide, and if you ever toured an ancient castle you’ll know what I mean. But in order to make them functional for this game they need to be big enough to support the required base sizes. The tower will prevent the need to model it. Also my inner wall expansion will drastically reduce the space inside the courtyard making steps even less practical. The tower I’m going to make large enough to hold a basic 20 man unit on top of it. I’m also thinking I should have enough room to place a balcony of some kind on it, perhaps as a battle platform for a long range wizard or a sharpshooter. 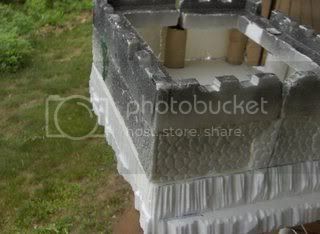 I’ve spent some time creating a skeleton for the tower and what I’ll do is layer on pieces of the Styrofoam sheet and add doors, arrow slits, etc. Wow, I remember that castle. Trevor had a playing field almost 8 feet long, and he used to get big chunks of wood and moss to use for foliage. It actually came out pretty cool. Have fun restoring it! Ah! The memories of childhood. Reminds me of the pre-made plastic mat we used for WWII soldiering, and I wonder if it is still hanging around at my parent's place. Seems like a super project, restore the best of the old and add some new things for an improved flavor. The base could be very wise, with crenulations, a real gate, and enlarged upper deck with location for artillery makes sense. A tower could be an excellent addition, and this could hide the stair case to avoid the difficulties of creating a useable stair case near the wall. Yeah, although it doesn't look like it at all. Perhaps the inspiration behind it was the double-page spread in the 40k Rogue trader book showing the Space Wolf fortress on the planet Lupus? It looked like the Magic Kingdom set up for war. It set the precedent that static fortresses like this exist in the 41st millennium. (Scott)Ah, yes. Castille de Muerte. AKA the Castle of Doom. Anybody unlucky enough to start the game defending it, or foolish enough to move units in there during the course of play, would quickly affirm the aptness of the moniker. Whole units of Eldar, mobs of Orks (including, naturally, Warboss retinues), squads of Space Marines and platoons of Imperial Guard are all laid to rest within its confines...an enduring testament to the fact that static defenses have no place in 41st century warfare. Especially when Vortex grenades and D-Cannons abound! Now that we're moving this over wholly to WHFB, perhaps the spirits of the many dead defenders can finally rest? no. They need to burn in hell. I have begun work on the base. No pictures of the base at this stage as it’s currently too dull to showcase. However I thought an idea of the width and height of the tower might be interesting. As you can see it will be wide enough to fit most units (US20 empire/US16 Orcs etc.) although ideally I’d think most players would stick an artillery piece on this and I tend to base my artillery on this size movement tray anyway. And it’s going to be fairly tall and should give a commanding impression when done. 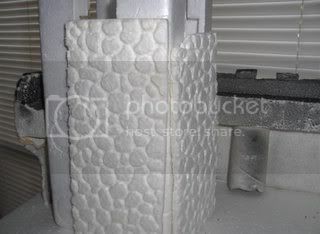 I thinking I will sort of “jigsaw” the Styrofoam with a foam cutter to avoid strange seam lines and awkward joins. Question: does anyone have opinions on color? I always assumed this would look like a granite stone construction but I’ve seen enough real life examples of limestone and flintstone castles to make a stab at that. "Death Castle was a place of massive death, whereby I slaughtered many opponents over the years. I think the castle should sit on a small bailey--it is only befitting Death Castle! We could even build a full motte & bailey system for the little castle!" As for your question, I'm not really sure actually. 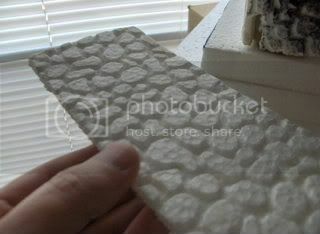 They found these Styrofoam sheets in England at a D.I.Y. shop (an American equivalent to a Lowes or Ace Hardware) 20 years ago! The sheets where uses to insulate an entire hallway and individually must've stood approximately 8'X4'. I highly doubt this product would be sold for this purpose in the U.S. due to the difficulty in finding paint that won't melt it and the general flammability of it. I've never seen anything like it since. The pieces we used to build this castle and other buildings were scraps left over after they used this stuff to wallpaper a bathroom. I hope someone can find it, I would like to have some more! I have finished the basic construction of the base. After some serious contemplation I settled on making the entry way to the castle a steep ramp to give the defenders the advantage of height (imagine the difficulty in trying to push a battle ram up that and doing it with enough force to pierce the gate!) I may level out the field a bit more and add more rocks at the base of the foundation and alongside the ramp. You know that to make the stuff harder etc. 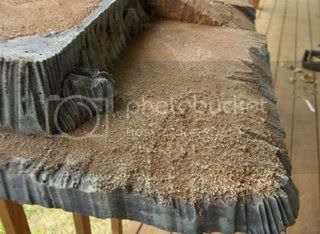 you need to go over it with white glue thinned down and mixed with a little black paint. That way you can see what you have covered already. Do the second layer in a different colour, and the third in another one. That's stolen from steveb, not my own idea, though. if that fails, I'll be slowly slapping it on with PVA glue for about a week. Spray Adhesive and styrofoam don't play well together. It has the same melting effect as standard spray paint does. 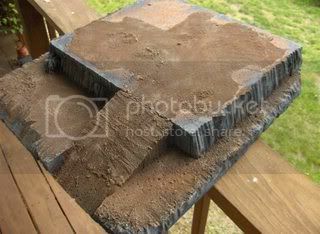 So, I've spent what little free time I've had this week, when daylight was available, gluing sand to the base. I went and got a broad paint brush, an old baby food jar, water, Elmers glue and sand from a near by site where an above ground pool once was, and went to town on it. This evening I just used Design Masters floral spray paint on it and gave the thing a base coat of brown and now the it's sitting in my utility shed drying and venting. I'll decide tomorrow if I need more sand on it or not and go from there. I'd like to have the base mostly finished by the weekend so hopefully I can start truly renovating this castle. 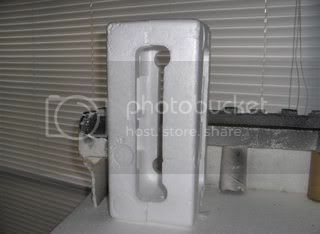 Design Masters is the best spray paint to use with styrofoam as it does not melt it! But the fumes are just as intense. I will give you guys a proper visual demo soon. Imperial Forge finished his and started a new thread for it. Check out the windows! Also note the other cool pics in this thread, especially the ship. The base is mostly complete. I have reached a point in the painting where I’m satisfied that I can move on to attaching the castle to it. The base is not totally done; that’ll be the last step of the whole project when I apply the grass. I’ve also begun work on the tower. I’ve started by evening out the frame and then applying the stone strips that I have left to it. This is proving to be time consuming for a number of factors, mostly being the slow drying time of the glue. Trevor built this castle originally using Elmer’s Wood glue (or Carpenter’s Glue), which I thought was over kill compared to the regular Elmer’s glue. 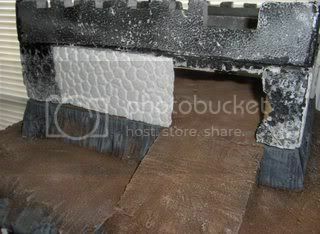 However when it comes to rejoining the two wall sections, attaching it to the base, expanding the ramparts and attaching the tower, I will most likely use that wood glue. I considered using a hot glue gun, but the super quick drying time unfortunately doesn’t allow for mistakes or alternations. If Trevor had not used the Wood glue originally, this castle might not exist anymore at all! 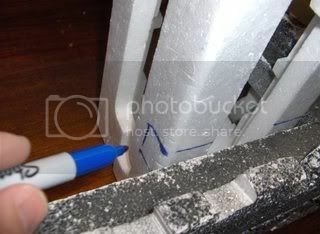 So as I piece the tower together, I’m reaching into the inside and putting strips of tape on backside of the cracks. I have some modeling paste stuff that I’ll use to fill in the gaps. The way that I have to join these pieces to the tower frame will help give the illusion that this was always apart of the castle. 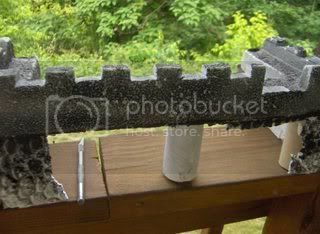 Since the amount of stone work embossed pieces that I have is preciously limited, I had to take into consideration the extension of the ramparts during this step of construction. I did this by measuring sections of the parts that will be hidden and marking them with a sharpie. 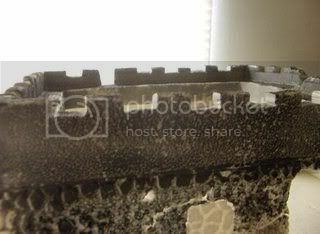 I’m also looking at the years of battle damage this castle has suffered and trying to determine how much Styrofoam stone stripping I’ll have left over to be able to repair the walls. As I look at the front of the castle and it’s becoming clear that I may have to replace 80% of it. The section nearest the gate received the worst of the original dose of spray paint in ’89 and the result is that a lot the cobble stone detail is just gone (blame it on the lascannons). 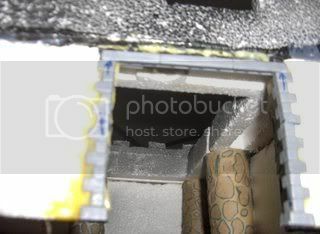 The entry way is very badly damaged and I’d like to hide the toilet tissue tube, ur, I mean support column, a lot better. Yay for 60 inch strength ten, D6 wounds weapons! Liking the tower, looks pretty, and your base looks awesome. How's the ramp work though, is it as steep as the pictures show or is it misleading? The ramp is definitely steep! 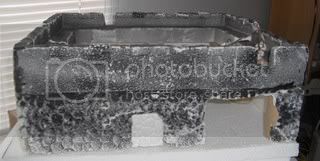 However there is enough grit on it to hold most models just fine although some of the larger more top heavy ones could have problems with it. Loaded movement trays tend to slid off of it as they are usually quite smooth on the bottom. That's a shame because I made the ramp wide enough for a standard 5X4 mansized unit. Progress is slowly being made. The tower’s wall sections are mostly in place and the renovation work has truly begun. I spent some time working the old front wall section off, which proved to be tougher than I thought it would be. I was trying to preserve as much of it as I could but it was so brittle and the glue was so tough that it broke up as I removed it. Laying side by side you can really see just how harsh the spray paint was to the original wall. I used a hot glue gun to fix the new wall in place. I then built from a Mordheim building sprue what is going to be the front entrance’s doorframe. Getting the doorframe mounted to the wall will probably be a challenge but once done should make the front of the castle look less shabby.. I suppose you could put felt under the movement trays to help grip. Are you going to attempt openable doors for your castle also? I'm still working on trying it figure out how to do it and make it sturdy enough not to break. For the walls you could coat them in pva glue to add strength, seems to have worked on mine and then paint away freely on the hardened surface. Make magnetised trays, check this article in the Workshop. Stick a few magnets into the ramp. For the door. I'm thinking about faking it. I'm thinking about making a solid piece that looks good with the model and can simply be removed when not needed. I think this will be more practical during play and will reduce the amount of model displacement during combat. Besides, if the door is opened during a siege, it's most likely due to it being smashed in any way. 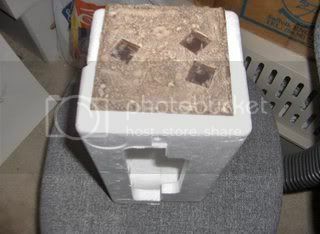 I know how I think this could work, I just haven't figured out exactly how to build it yet. Obi: I thought about embedding some magnets into it, but opted against it in the long run. I guess my lazy enemies are just gonna have to do it the old way for the few rounds they hang out on the ramp! I am strongly considering putting magnet strips on the ramparts though. That is probably the area with the highest risk of falling models. I can’t believe it’s been over a month since I did an update! It’s been a busy month for me with work, assisting my girlfriend with her gardening, and preparing (and taking) a short vacation this past weekend. But Death Castle has slowly progressed. The part that took me the longest was mounting the plastic Mordheim frame into the main entry way and filling in the resulting gaps. For some reason I convinced myself that Woodglue would make a great filler (and it does the trick rather well on small gaps) but the slow drying time proved to be a challenge. I still need to tidy up some areas on the frame. I have this great latex modeling filler but I seemed to have misplaced it and I’ve not had the spare time to go seek out more at the local stores. Next came the most important step so far, the joining of the two halves! Death Castle is now whole again! 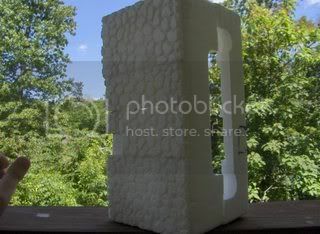 I then proceeded to take old TP tubes and cut out patterns similar to the “rocky” surface of the Styrofoam walls and glued them onto the columns. This should create a more unified look once painted. Next step. Finish filling in all the gaps, and then prime the whole thing with Design Masters flat black before adding on the rampart extensions and finishing the tower. Wow. It's looking awesome man!